The US is headed for a showdown with much of the rest of the world over control of the internet at this week's UN summit in Tunisia. Most net users probably do not spend a lot of time worrying about who runs the resource they are using, but there is a global battle brewing over that very question. The internet grew out of US military and academic research, and the US government still has certain measures of control over it. 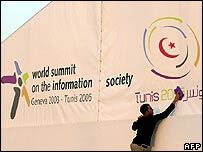 Other nations, however, are clamouring for a bigger say and are pushing for significant changes at the UN's World Summit on the Information Society. The issue is expected to overshadow the summit, which is intended to focus on how to take the internet to less developed parts of the world. Most internet users around the world would agree that the internet has been functioning, technically, quite well. It is not a monolithic entity. In fact, it is comprised of some quarter of a million private networks that choose to interconnect with each other. A California-based non-profit created by the Clinton Administration in 1998, the Internet Corporation for Assigned Names and Numbers (Icann) is charged with making sure that these networks talk to each other. The organisation says its job is technical, making sure that web addresses take surfers to the right site. What Icann does not do is "run" or "control" the internet, according to Theresa Swinehart, General Manager for Global Partnerships at Icann. "Actually, nobody runs or controls the internet single-handedly. It is multiple parties, multiple businesses, users, and networks connecting to this. All these different groups, organizations and companies have a responsibility." But Icann operates under a memorandum of understanding with the US Department of Commerce. To some, that looks like American control of the internet. "The rest of the world doesn't want to see US hegemony here, in large part just for symbolic reasons," says Jonathan Zittrain, Chair in Internet Governance and Regulation at Oxford University. "So there's one set of countries, anchored by Iran, Cuba and China, that would like to see some process by which governments of the world have a much larger hand in controlling the shape of the internet." 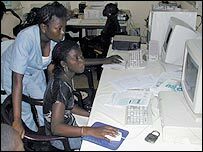 Many African politicians are also asking for "regime change" on the internet, and the European Union called in September for a new, international body to govern the net. But the Bush administration and many in the US Congress reject the idea. Both the US Departments of Commerce and State have reiterated that the US will maintain what they call "stewardship" of the internet. They contend that the US, working with Icann, is best placed to ensure an open, secure and stable online environment. And in a recent letter to the Wall Street Journal, Republican Senator Norm Coleman wrote: "There is no rational justification for politicising internet governance within a United Nations framework." That view has plenty of support outside the US. "We don't see any advantage in moving toward UN control," says Bill Graham, who works on internet governance issues for the Canadian government. "In fact, we're on record as opposing that. We just feel it would be bureaucratically heavy and frankly, unnecessary." Mr Graham supports a compromise measure, some kind of international forum that would have no oversight duties, but would help other nations feel like they have more input into how the internet functions. Some in the anti-US camp are threatening more drastic action. They say, if the US won't cede some control, they will create their own internet. Michael Geist, who teaches internet law at the University of Ottawa, says that a world of multiple "internets" might not be a good thing. "What's at risk is the possibility that the communications system of the internet that we've come to rely upon, the ability for me to send an electronic message anywhere around the world, and similarly access websites around the world, and have little doubt that my requests will be recognised, is put in some measure of peril by the fact that we might have several different internets," he said. Few think this will actually happen, but the threat will be there as politicians and technocrats from across the globe meet in Tunisia from this week. Special preparatory meetings to address the internet governance issue are under way ahead of the summit's official start on Wednesday. "It's a political battle where, I think it was Henry Kissinger who once said, 'the fighting is so fierce, precisely because the stakes are so small'," says Oxford's Jonathan Zittrain. "Almost all of these things are in part the result of what happens when you get a bunch of diplomats in a room. "They'll find a way to have a grave disagreement, then have a way to work it through, and eventually come out with a communiqué, and it may not have anything to do with the technically realities of the way the internet works." It would be better, Professor Zittrain says, for governments to focus on the serious internet issues that do need an international solution, especially things like spam, phishing, and cyber security. Others have called upon leaders to focus their efforts on the original intent of the summit to find ways to bring the benefits of information and communication technologies to the developing world. Does the US have too much power over the internet? Can the digital divide be bridged?